The latest UN weapons inspectors' report on Iraq has deepened divisions on the Security Council. US Secretary of State Colin Powell said the council should "in the near future consider serious consequences" - code for war on Iraq. And the UK Foreign Secretary Jack Straw told the council a peaceful solution of the crisis "will require a dramatic and peaceful change by Saddam". However, France, China and Russia said inspectors should be given the time they need to complete their task. At a news conference in Rome, Iraqi Deputy Prime Minister Tariq Aziz said Iraq was "willing - genuinely and accurately - to implement [UN] resolutions and we are doing our best to this purpose". Earlier, UN arm inspector Hans Blix told the council that Iraq still needed to provide evidence to back its claims it does not possess banned weapons. But he took a more positive line than in his report two weeks ago, saying Baghdad had made progress in a number of areas. 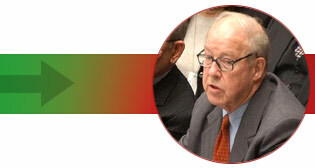 What do you think of Hans Blix's report? Can war be averted? This Talking Point is now closed. Read a selection of your comments below. Blix's report has certainly made a strong case to give more time for the Inspectors and helped in building public opinion for a more diplomatic solution other than war to end this crisis. What will eventually prevail is yet to be seen while our democratic leaders seem to have no penchant to sway to public opinion. Yes, Blix's report tells us that Saddam is improving his cooperation with the inspectors. Yes, there's still room for diplomacy. Yes, all this - and the stance of France, Germany, China, and Russia - totally misses one fundamental point: Saddam has shown throughout his political career to be a tyrant, a master in deception and lies, and an opportunist. Saddam has shown to be a ruthless dictator bent on enforcing his own personal rule through force, even against his own people. We now have a golden opportunity to finally do away with him, for the benefit of the whole mankind. Give Mr Blix more inspectors. Swamp him. For as long as the inspectors are there we all will have peace and people won't die. Instead, spend those $billions we are so ready to waste on opening the door in North Korea - where we know they have weapons of mass destruction and have said they'll use. Keep all this up for as long as Bush is in the White House. I'm so amused on how these anti-war activists argue that in order to disarm Iraq, it should be done in a peaceful solution. By all means it should be. But you know the whole world was doing that for the last 12 years. We have been patient enough to try to persuade Saddam to disarm peacefully. Did Saddam show any signs at all that he is willing to cooperate? No he did not. He mocked all UN Resolutions for him to disarm. His seemingly act of cooperation these days is but one of his tactics to ease the pressure. Must we rely on the words of a proven tyrant and master deceiver or must we act now before it's too late? War should be used as a last resort to resolve any dispute. In this case the military is being used as an instrument of government policy and statecraft. This gets particularly alarming, if other states follow the US lead in utilising their military strength to settle old scores. I am a 14 year old Student in Winchester. I am always interested in the goings on in our country but recently I have become lost. Why is all this necessary? I realise that 9/11 was a big event and that something should be done about it but as far as my knowledge is concerned, we don't even know who was responsible! Any advice in understanding this drastic situation? I don't want war. Bravo Blix, There are few people remaining calm and not adding fuel to an already inflamed position, his must be the hardest role to play, and not succumb to the general paranoia. There MUST be things of greater importance than the appalling state of affairs in Iraq .. we all know who helped them obtain most of the weapons and technology, and who benefits from their natural resources .. If human rights abuses and rogue states worldwide were met with similar threats I MIGHT just reconsider, but then I sincerely believe that no one gains respect and reduces global insecurity by waging war. How much longer do Iraq citizens need to live under sanctions? Saddam could end this easily but chooses to put the inspectors on a snipe hunt. Further inspections will only result in more hide and seek. He should be disarmed! If so many countries, especially those on the UN Security Council, disagree with the US stance; they should step up and protect the UN Charter and draw a line in the sand with the US. The UN is meant to stop a war, why not a resolution against a war if the inspectors are making progress? The US veto would come, but the statement would be very symbolic. Surely there's something else we can try? Why are we so keen to go to war all of a sudden? The world has gone mad post 9/11. Saddam Hussein isn't a nice guy, he's done some of the most terrible things imaginable, there's nothing I'd like more than to see him out of power, but this is not the way to go about it. How come with all the political minds in the world debating this issue nobody has come up with another way around this situation? So far we've tried war (1991), we've tried sanctions, and we continue to try inspections. Surely there's something else we can try??? While I do not hold with the Bush/Blair argument for war, it is clear that Saddam is not willing to disarm, and that all of this "extra information" they are now providing should have been declared at the start in their initial declaration - particularly of the development of a weapon that exceeds guidelines set by the UN. Hardly seems worth Mr Blix making his report though, as Bush will attack Iraq next month anyhow, even if Saddam came clean. When Iraq recently handed over a small amount of chemical agents that they should not have had, why did the inspectors not know about the site they were kept? Does this mean there are sites like these all over Iraq that we have no knowledge of? Will this mean we have to spend an eternity in finding these sites? To me, this is the sort of evidence that points out that he is hiding WMD from inspectors. Surely now is the time for a final deadline. The threat of military action has forced Iraq to cooperate. Inspections are getting results and it seems that the additional inspectors etc will enable inspections to achieve what is required. The UN aim is to disarm Iraq, not remove Saddam. There is no need to kill innocent Iraqis and put UK servicemen at risk when Inspections are working. The Blix report shows more cooperation from Iraq than can be expected from any dignified sovereign state. The Iraqi nation, not Saddam, has been humiliated. And this is seen by Muslims across the world as an attack on their freedom. Saddam is unlikely to create a single suicide bomber, but US and UK policy, through their most unfair policy with respect to disarming will certainly create thousands of suicide bombers all over the world. The Iraqi government will continue to give the impression of making concessions to the UN each time the pressure is upped. The past 12 years, and the most recent developments, have proved that this is evidence of an exceptional propensity for splitting opinion in the international community rather than an acceptance of the obligation to disarm. This is what they said they agreed to 13 years ago. France and Germany didn't have 3000 of their fellow country men and women murdered, we did. I a retired USMC would like to see what would happen the next time they cry for our help. I feel a case of deafness coming on. All efforts must be made. The consequences are too frightening even though the US is trying to convince us that they can light a single match in a matchbox without having the entire area combust. Also the attitude with which this is being approached is questionable. Last night's comment by Bush that the UN would "fade into history as an ineffective, irrelevant debating society" leaves me wondering where the US would have dragged us had it no one to check its impulses. Thank you Mr Blix for continuing to be fair and honest about the inspections in spite of the enormous pressure you must be under to by the Bush administration. I do not want to go to war. Mr Bush does not speak for me. Thank you again. I'm sure this must be very difficult and exhaustive. Hang in there. I feel that Blix's report calls for further inspections to be made. Each point he makes implies the need for further 'response' rather than 'cooperation' from Iraq. I am a British citizen living in America, and, quite frankly, it scares me that the two governments I should feel the most empathy with are the same two intent on rushing into war without all the facts. No sane person would relish the thought of war in any part of the world. Diplomacy must be the way to resolve problems between countries. Unfortunately everyone against a war should realise diplomacy will only be successful if conducted between two reasonable people and whatever anyone may say, Saddam cannot be described as reasonable and therefore we are left with only two choices. Ignore the problem or do the positive thing and act now. This tells us nothing we did not already know or guess and all parties could latch onto various statements to bolster their arguments for or against an invasion. I therefore predict that we in the UK will aid the US and be at war with Iraq very shortly. Whether this is a good thing or not depends, like all wars, on the outcome. I think Saddam has finally realised the amount of trouble he and his country are in and is desperately attempting to comply - But maybe it's too late! From Dr Blix's report, the inspections are working. Given time and more firm pressure, the crisis can be solved peacefully. Mr Blix's report makes clear that there has been movement on a number of issues, including interviews with scientists, overhead surveillance flights and destruction of banned chemicals. Iraq's acceptance of South Africa's offer to help it disarm is particularly encouraging. There is every reason to allow the inspection process to continue and, if necessary, to strengthen it. A firm but rational approach is needed; a rush to war is totally unwarranted at this stage. Why is it that the UN cannot take a firmer stance on the issue? Both in this report and Dr Blix's previous report he uses a tone that appears unaware of the impending decision to go to war. For example, he suggests the names of those involved in the destruction of materials would be useful as if he intends further work to be carried out. As we all know there may not even be an opportunity for further work to be carried out due to the fact that war may soon be declared on the country. Why is it that the UN cannot take a firmer stance on the issue and state that on the evidence provided so far, military action would not be justified? As Iraq has accepted the offer of help from South Africa, then surely this shows a changing of attitude and strong intention to co-operate, and must only strengthens the Franco-German proposal that more time should be given. OK, this is enough. This is what Bush and Blair wanted - evidence of violation, irrespective of Iraq's assistance to the UN. May God have mercy on us all. Should UN inspectors be given more time?